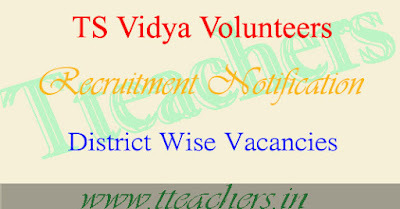 TS Vidya Volunteers district wise vacancies 2017 VVs notification : The Telangana Govt has decided to fill 11,428 Vidya Volunteer posts as per rule of reservation and merit in the existing vacancies of SGT, SA and language pandits till the regular teachers are needed.Telangana Chief Minister K. Chandrasekhar Rao cleared the appointment of Vidya volunteers(VVs) file in a meeting with Education Minister K. Srihari. This Vidya Volunteer recruitment Notification 2017 is going to release soon. 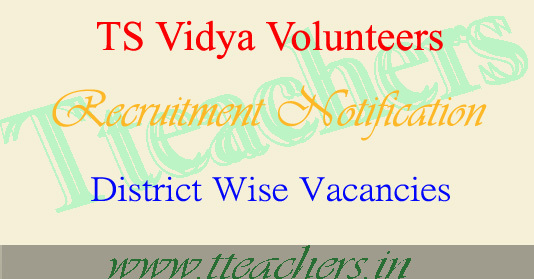 TS Vidya Volunteers district wise vacancies 2017 : The TS CM Chief Minister K. Chandrasekhar Rao directed the district collectors to complete the appoint of Vidya volunteers(VVS) on temporary basis till the TSPSC completes the recruitment process of regular teachers. The TS Govt, for the first time, has handed over the recruitment of teachers posts to TSPSC. The Directorate of School EducationTelangana issued new guidelines for engaging the service of Vidya Volunteers for the academic year 2017-18. These guidelines kept in Go 97 dated 29.06.2016 should be followed for the recruitment of Vidya Volunteers for the academic year 2017-18. Vidya Volunteers recruitment are purely temporary basis and they can be terminated before 23rd April, 2018. So candidates can check ts vvs vacancies 2017 , TS Vidya Volunteers district wise vacancies 2017 from the following table.